I absolutely love eggs and couldn't believe we were going to get to try these eggs out. These eggs are called "safest choice" for a reason. Warm water bath pasteurized and absolutely the freshest tasting eggs that I have had in a long time. I wanted to make a dish that made the egg the star, while also providing a little bit of a show to go with it. 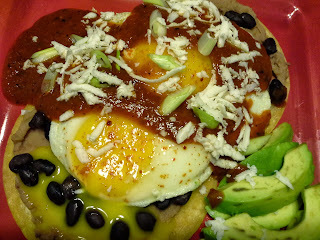 I think I came up with a great example of that in my Huevos Rancheros. This is a dish you could easily make for a great meal anytime of the day! I made my own ranchero sauce, but you can easily eliminate that step and use your favorite brand. This is such a versatile dish that you can make it with any ingredients that you want. Turn your oven on warm or the lowest setting possible. Place the first 5 ingredients into a small sauce pan. You want to soften them up a bit and get the juice out of the tomatoes (about 15 minutes on medium-low heat). Set aside to cool. In a skillet, place a little oil (just so the tortillas won't stick), medium heat. Cook your tortillas for about 2 minutes per side. When one side is done, spread a layer of refried beans on the tortilla. It will warm through while you are cooking the other side. Place in the oven on a cookie sheet while we finish the rest. Now put your ranchero sauce in a food processor and pulse until you get the consistency that you want. I have had this chunky and also pretty smooth. It just depends on what you want. Pour sauce back into the pan and place on the stove on low heat until you need it. You may want to taste and see if you need a bit of salt and pepper. In your favorite egg cooking vessel, place a thin layer of oil. Sunny side up is what we are aiming for! Cook the eggs one at a time to ensure that the yolks don't break (unless you are an egg cooking expert, which I am not!) As you get each egg done, take your cookie sheet out of the oven and place it atop each one of the tortillas. When you have all of these assembled, plate and top with your ranchero sauce. Garnish with crumbled Queso Fresco and onion/cilantro.